The day-long conference will gather major political figures and international and national experts to reflect on lessons learned from truth commissions that have emerged from peace processes around the world and how they may enrich the discussion in Colombia. 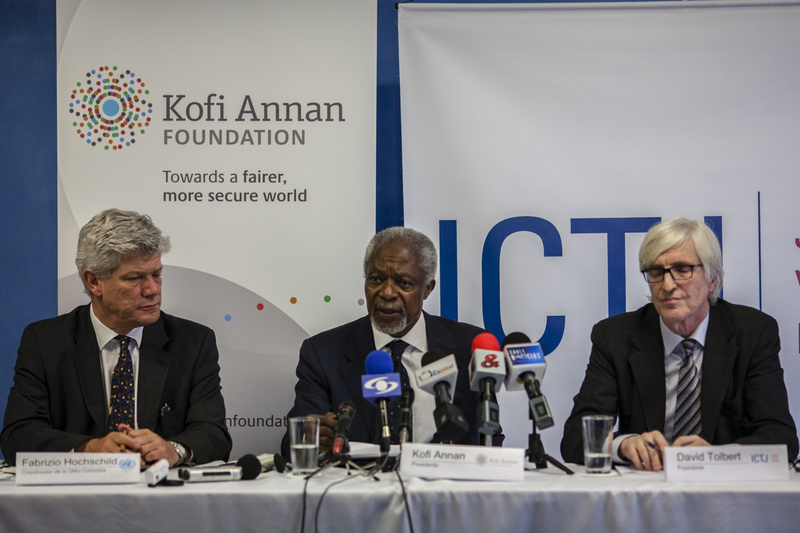 Participants will include Mr. Juan Manuel Santos, President of Colombia; Mr. Kofi Annan, Chair of the Kofi Annan Foundation; and Mr. David Tolbert, President of the International Center for Transitional Justice. As peace talks advance between the Government of Colombia and the FARC guerilla group, an essential element of negotiations is how best to examine the truth about violence and abuses committed during the armed conflict. The creation of a truth commission is now being discussed in Havana. The search for truth about the conflict concerns Colombian society as a whole, and the conference will provide space for Colombians from different perspectives to discuss ideas, expectations and questions about the country’s truth-seeking efforts. According to a report published last year by ICTJ and KAF, “Challenging the Conventional: Can Truth Commissions Strengthen Peace Processes,” the mandates of truth commissions have expanded in recent years to cover a growing list of functions and violations. This conference is part of a joint effort by the International Center for Transitional Justice and the Kofi Annan Foundation to promote and facilitate dialogue on the experiences and lessons learned from truth commissions that have emerged from peace processes. Their joint 2014 report exploring these issues is available in English; a Spanish edition will be launched at the conference. The conference is organized with the support of the Norwegian Embassy in Colombia and Revista Semana. ICTJ’s work in Colombia is also supported by the Government of Sweden.